Today I will be finishing off my series on Rivals of Ixalan limited, and will be breaking down and walking through my sealed pool from GP London – just in time for the last sealed RPTQ this weekend! 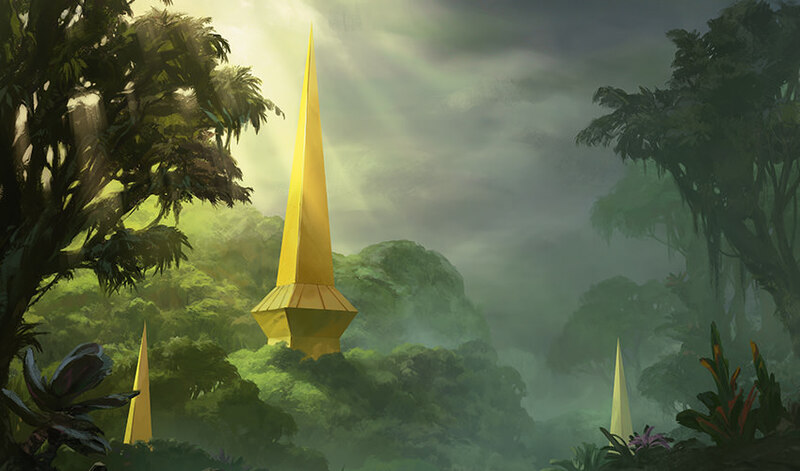 If you have not checked out my previous article on Rivals of Ixalan sealed, where I went over my top ten insights about the format, I recommend checking that out first here. 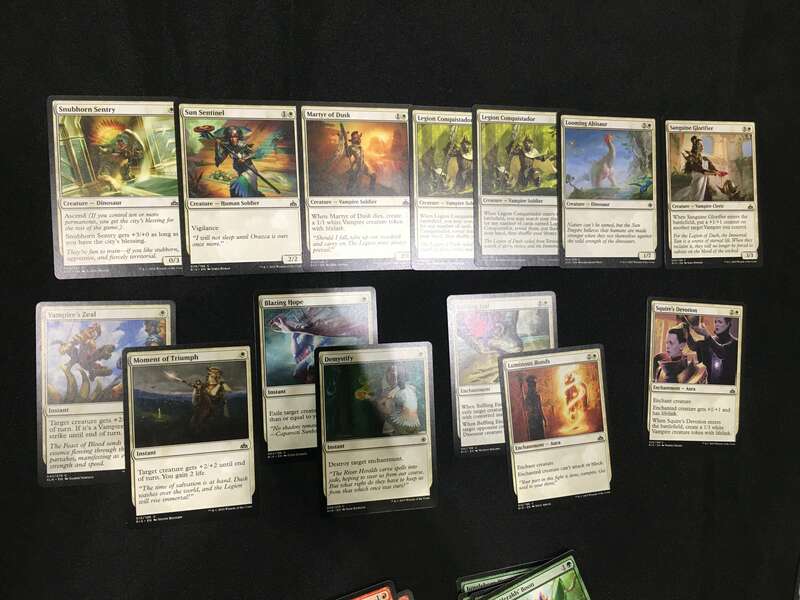 *I recommend trying to build the Sealed Pool yourself first, before reading the rest of the article, so that you can see how close our decks were. 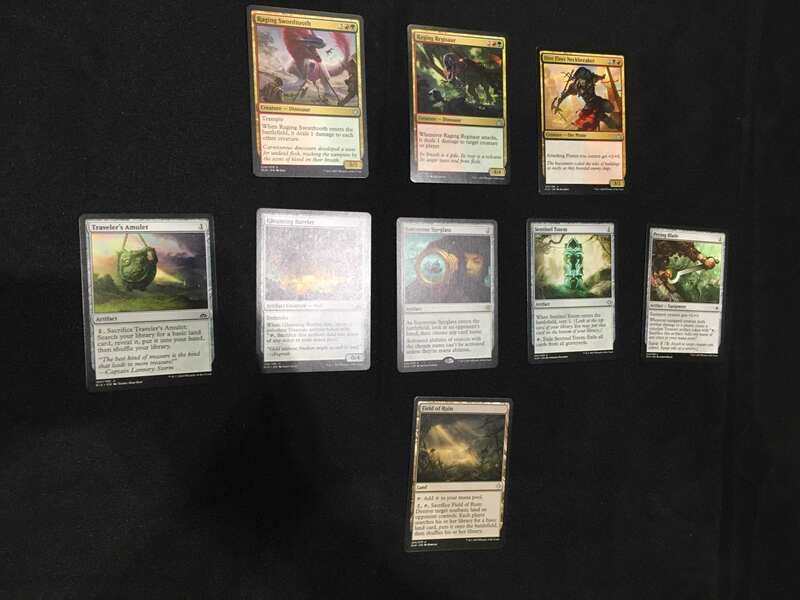 Since Rivals of Ixalan is very bomb orientated, the first thing I look at when I open a pool is to see what bomb rares I opened, as well as what removal I have to answer opposing bombs. 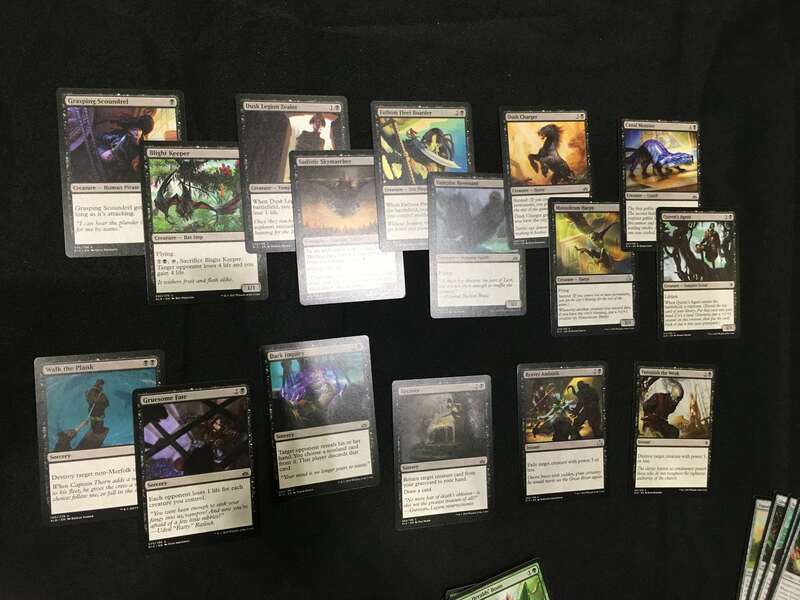 In this pool, there were three clear bomb rares that stood out – Carnage Tyrant, Polyraptor and Ghalta, Primal Hunger – with Dire Fleet Daredevil also being a solid rare, while Deeproot Elite is great if I have enough Merfolk creatures to support it. As for removal, I was slightly limited on it in this pool, especially considering how abundant common removal spells are in Rivals of Ixalan. Blue and Green had no removal outside a single Plummet, while White had Baffling End and Luminous Bonds, Black had Walk the Plank, Reaver Ambush and Vanquish the Weak, and Red had Mutiny, Bombard and Unfriendly Fire. This meant that I had a decent amount of removal available for killing smaller creatures, but only had two hard removal spells, which was slightly worrying. After going through the rares and the removal spells, I sift through each of the colors and see what they have to offer. 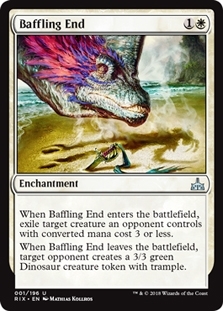 What immediately caught my eye in White were the two removal spells – Baffling End and Luminous Bonds. However, upon looking over White properly, it was clear that the color simply did not have enough playables, nor was there anything else enticing in the color other than the pair of removal spells. If there were a third Legion Conquistador, then I would have considered the color more, but with only two copies, it was clear that I would not be playing White, but I did want to splash the removal spells if I could. If White was terrible, then somehow Blue was even worse. The best Blue card I opened was Dive Down! There was also nothing in the color that I wanted to splash, so it was clear to me that I was not going to be playing Blue. Black looked relatively similar to White, but with better spells and slightly more playables. Walk the Plank is an excellent removal spell, while Reaver Ambush and Vanquish the Weak are serviceable – though a lot worse in sealed than in draft since there are more big creatures. Dark Inquiry is also a card that I do not mind playing in sealed, especially in a bomb-heavy format such as this one. 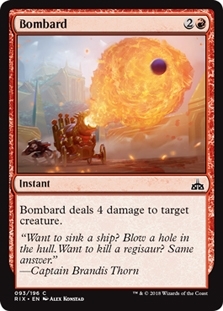 I also really like Recover, as games tend to go long in this format, but there are few card advantage spells or mana sinks, so any card advantage – especially one that can return a bomb rare – is excellent. One issue with Black though was similar to White; its creature quality was relatively lacking. While Sadistic Skymarcher is decent, outside of that, there was nothing else that stood out. 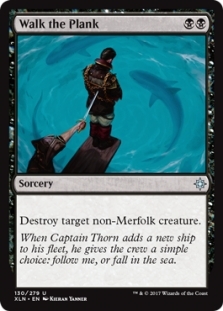 The other issue was that the best card in the color – Walk the Plank – is not easy to splash, while its other cards are not powerful enough to be worthy of splashing for (though I would consider splashing for Dark Inquiry and/or Recover in post-board games against certain matchups). This meant that if I wanted to play Black, it would have to be one of my main two colors. Overall, Red was solid, but nothing spectacular. 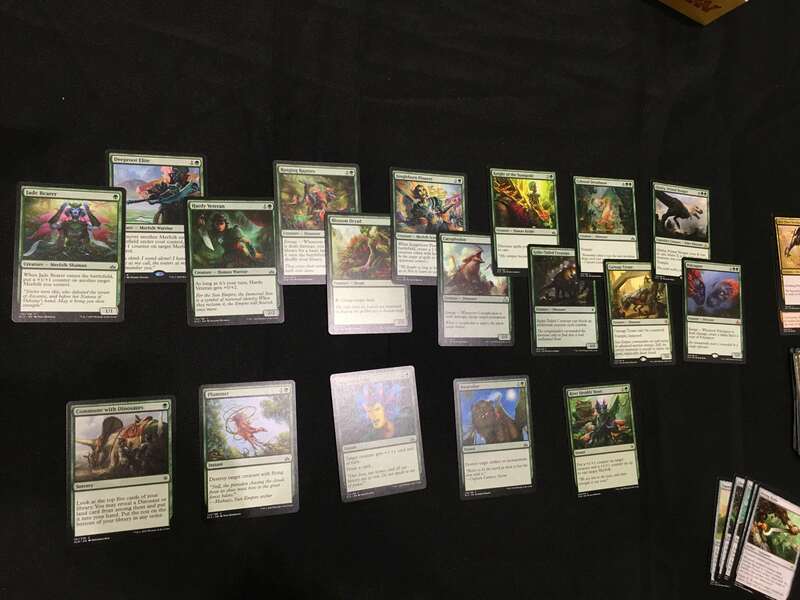 It only had six creatures in its color, but I would be happy to play all six of them in a given sealed pool, and Dire Fleet Daredevil and Needletooth Raptor are both fairly strong – especially as this pool had Raging Swordtooth and Raging Regisaur in it, which combos well with the Raptor. 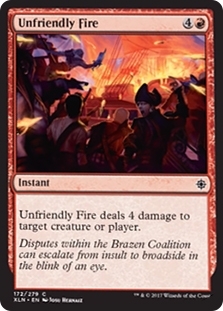 The non-creature spells were also fine, with Bombard and Unfriendly Fire being the noteworthy cards. Neither of them can kill large bombs but can kill most creatures in the format. Compared to its Black counterparts, I think that dealing four damage is a lot better than destroying creatures with power three or less. 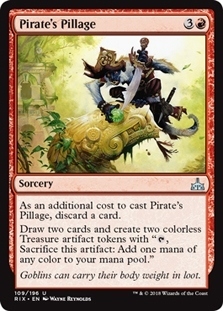 Another card that I also liked was Pirate's Pillage, which may not look like a great card, but as I mentioned previously, this format lacks card advantage and games tend to go long, so discarding a card is often not much of a drawback as you have lands to discard to it in later stages of the game. On the other hand, in the early game, the card can be a great way to ramp into large creatures, and it also helps you splash easier. Looking at Green, it was obvious that it was the best color in my pool. 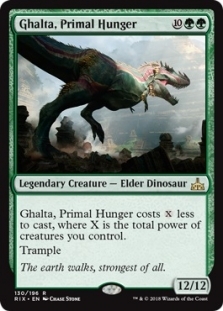 It had three bomb rares in the form of Carnage Tyrant, Polyraptor and Ghalta, Primal Hunger, while the rest of the creatures were decent, and a few also helped ramp into the big creatures. However, while Green's creature quality was excellent, it had close to zero non-creature spells. 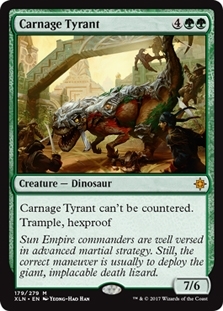 Outside Commune with Dinosaurs, it had nothing else that was playable in the main deck. I was going to be playing Green, but I needed to combine it with a color that had good non-creature spells. 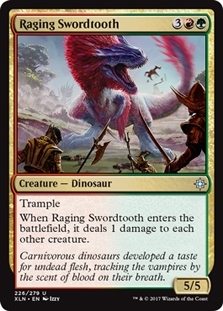 All three of the multi-colored cards are very powerful, with Raging Swordtooth and Raging Regisaur being the standouts. 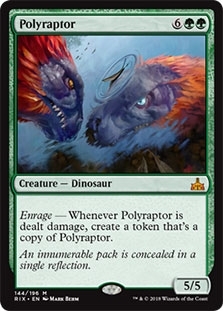 As mentioned before, they also both combo well with Needletooth Raptor. As for the colorless cards, Traveler's Amulet was very much needed for splashing a third color, as we had little mana fixing otherwise. 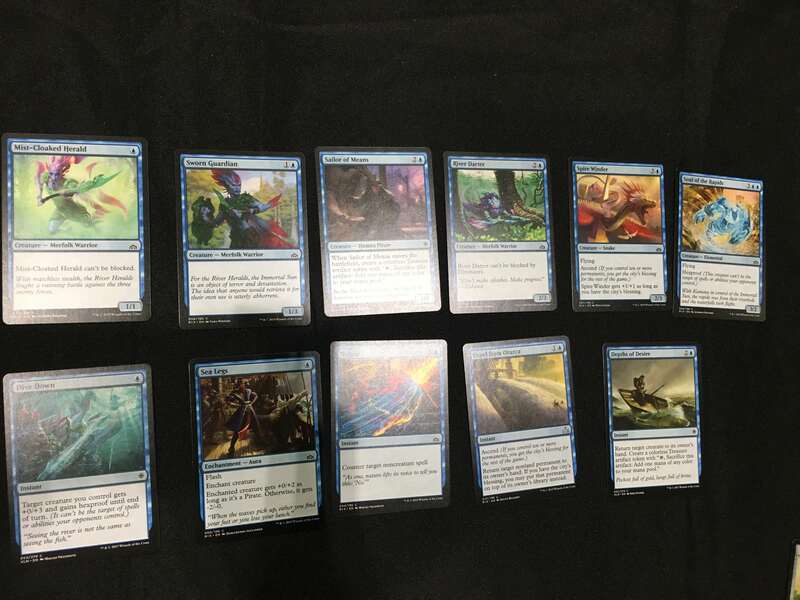 Gleaming Barrier is a decent two drop in any deck that is slow and has a lot of top end, which our deck looked to be. Field of Ruin is not a card I would play in the main deck, but is one of my favorite sideboard cards in the format, as there are a few double-sided flip lands that you need to deal with, such as Adanto, the First Fort. My first inclination was to try Green-Black, as it seemed like Black had the best non-creature spells. 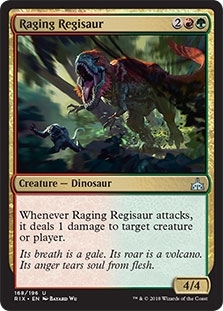 Since I did not have much mana fixing in my pool, I was not able to splash two colors, so I had to choose between splashing White for Baffling End and Luminous Bonds, or Red for Raging Regisaur and Raging Swordtooth. While it was close, as I needed more unconditional removal spells, I chose to go with Red as the quality of the two multi-colored creatures was too high. However, as I laid the deck out, it looked slightly too all over the place. While I do not like early drops very much in this format, I wanted more than five two and three drops. Sadistic Skymarcher was my best Black creature, but I did not have enough Vampires to cast it on turn three reliably. It also occurred to me that while Black's non-creature spells were decent, on second thought, it did not seem to be better than if I was Green-Red splash, White. Luminous Bonds would replace Walk the Plank, Pirate's Pillage would replace Recover, and Mutiny, Baffling End, Bombard and Unfriendly Fire would replace Reaver Ambush, Vanquish the Weak and Dark Inquiry. 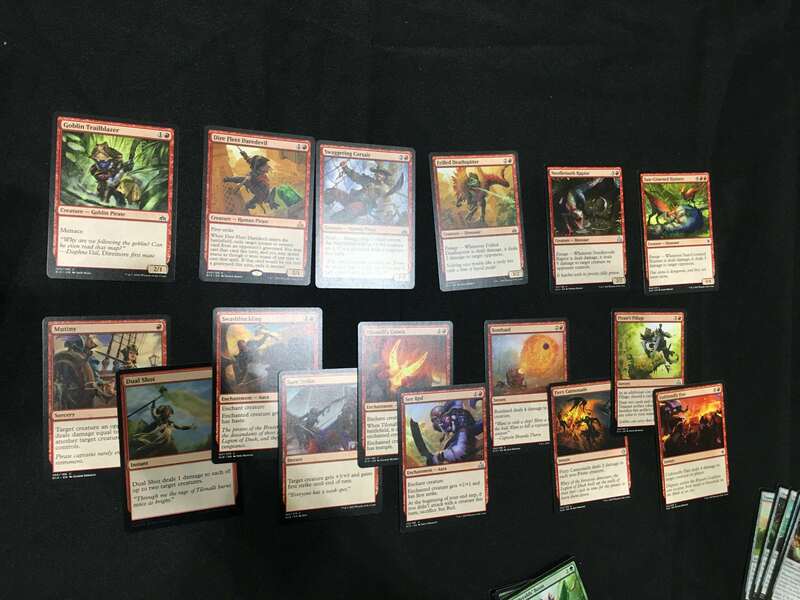 With Red, my creature quality would also significantly improve with the addition of Dire Fleet Daredevil and Needletooth Raptor. After realizing that Red was most likely straight up better than Black, I decided to try building Green-Red splash, White. Immediately after laying the deck out, it looked much better to me. While I still did only have two two-drops, I did have another three-drop now in the form of Frilled Deathspitter. 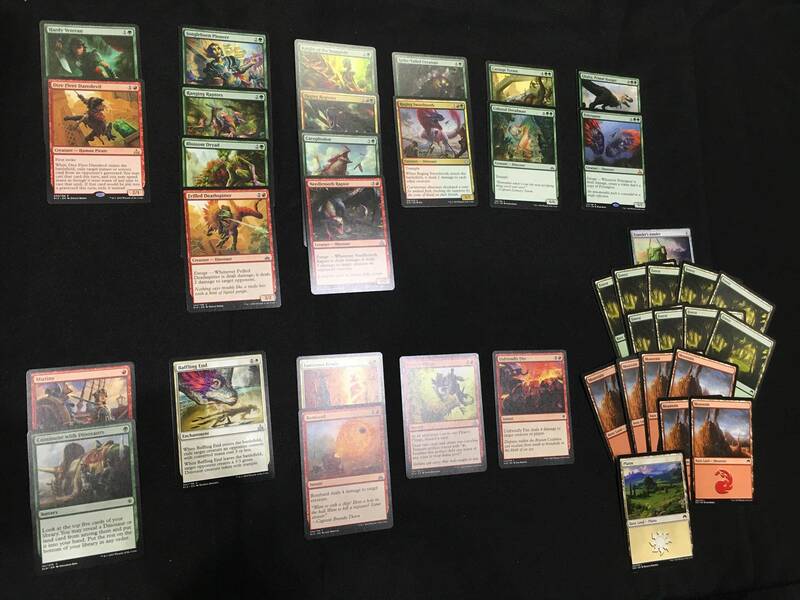 I also got to play Needletooth Raptor, which was great in this deck as it could combo off with the two multi-colored creatures. After agonizing over the last few card slots, the above was what I submitted. Initially, I was worried about my deck, as while it had multiple bomb rares, it also lacked ways to deal with them. I also did not have any card advantage outside Pirate's Pillage, and my deck looked like it would be prone to flooding, as it had a high land count and multiple ramp creatures. After finishing deck registration, I shared my pool with my teammates asking for comments, and almost everyone unanimously agreed with how I built the deck, except for one decision. Almost everyone said I should have played the Gleaming Barrier, but there were disagreements about what to cut for it – with some thinking that I should cut the Spike-Tailed Ceratops, while others believing I should cut the Baffling End. It ended up not mattering though since I could only bring it in during post-board games, by which I then knew my opponent's deck, so I could make the decision based on what they were playing. 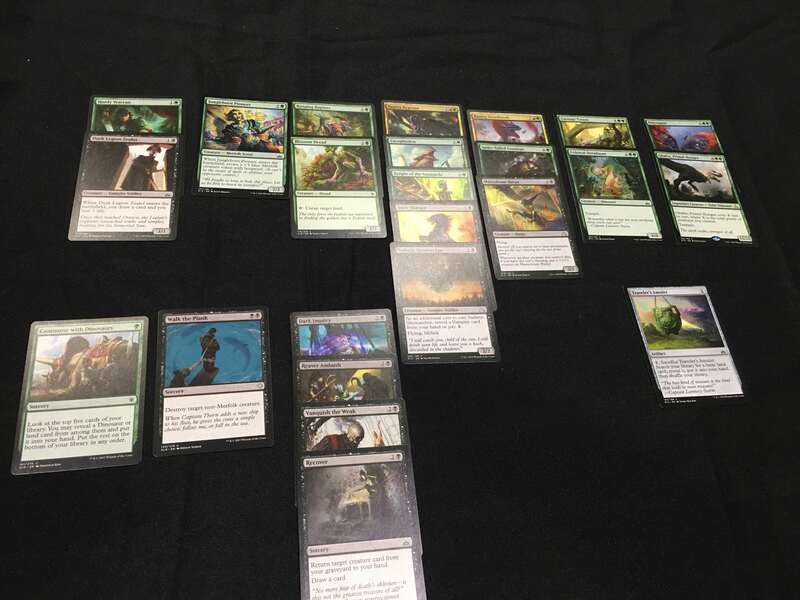 Overall, the deck ended up overperforming for me, and I managed to go 8-1 on Day 1. What I especially liked about this deck was that it had a lot of good sideboard options, and I found myself bringing in Plummet, Naturalize, Dual Shot, Fiery Cannonade and Field of Ruin multiple times throughout the day.